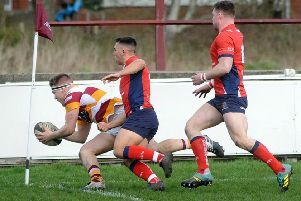 Last Saturday’s 27-19 Woodlands loss was a massive blow which saw Fylde slip to fourth in the National Two North title race, but Spragg insists second place is still a realistic goal as they bid to bounce back at Wharfedale tomorrow. Fylde trail leaders Hull Ionians by eight points and Chester by seven with four games remaining. It will need one of those sides to slip up more than once for Fylde to overhaul them. Spragg told The Gazette: “We made a really good start in attack against Chester and scored some very good tries (taking a 12-0 lead which became a 24-12 deficit). “We had opportunities to score more. We had a five or six-minute spell when we almost scored again but they turned the ball over and went the full length to score. “They scored again and that took a lot of confidence out of us. They probably outmuscled us a bit and some of our decision making was disappointing. The runners-up will face a promotion play-off against the second-placed finishers in National Two South – and, as things stand, that looks like a trip to Canterbury. Chester’s remaining matches are all against clubs in the top half of the table, starting with tomorrow’s home clash against promotion-chasing Huddersfield, who scored 91 points against South Leicester last weekend to replace Fylde in third. Fylde also face a testing run-in, with three of their final four games away, and after visiting North Yorkshire tomorrow, Fylde’s last three games are all against current top-six sides. Wharfedale lost by only three points at the Woodlands and Fylde will take nothing for granted against the 10th-placed club. Spragg has every confidence that last weekend’s defeat will not weigh heavily on his players’ minds. He added: “There is no chance of us taking Wharfedale lightly. “We gave them full respect at our place and we know their league position does not tell the full story. “With a full team available they are a very good side, so we will have to be honest. Another Sale Jets match on Monday means Fylde will again be without most, if not all, of their dual-registered players from the Premiership club; otherwise Spragg hopes to have almost a full squad to select from.